Once a young prodigy among the Angelic Orders, Glasya-Labolas is a powerful and rebellious young demon who can command great power should he choose to do so. After joining the rebellion against the Orders, Labolas was cast out with the other beings (now considered demons) and it appears he did not take it well. Deeply intelligent and phenomenally gifted, the young Count studied as much as he could of the ancient wisdom of his people. He is a master of all of the secrets of the occult and can weild these secrets against his enemies if he chooses to do so. Glasya-Labolas is thought to be somewhat moody and has a considerable dark side when upset. While he can teach his secrets to those who are loyal followers to him, he is also sometimes called the "author of bloodshed and manslaughter". When challenged this powerful demon will not hesitate to murder his enemies or the enemies of his friends. When tempted, he exercises his vast power through sheer force of violence and death, having little mercy for those who stand against him. To those loyal to him he can teach almost anything. He knows everything there is to know about any subject, including the past and the future. He knows the secrets of making a person invisible and can even generate love and respect among both friends and foes alike. In demon form Glasya-Labolas appears as a dog with wings like a griffin. 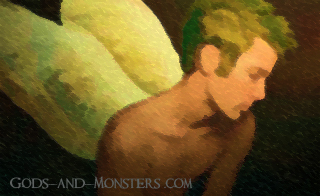 In his human/angelic form he appears as a young man, a teenager perhaps, with short blonde hair and white wings. Should one hope to summon Labolas, they should burn yellow candles during daytime when sun is out, and try to get sunlight in the circle. Glasya-Labolas loves to fly in the sunlight. One should also wear a ring of gold on their left hand and invoke the scent of fresh rosemary. Due to the volatility of this demon, only experienced summoners should attempt to contact him. Return from Glasya-Labolas to the List of Demon Names.